The Houston Chronicle awarded Rockwood Shutters, Blinds & Draperies a Top Workplace honor in the Houston mid-size company division. Rockwood Shutters also received special award for best Work/Life Flexibility. We’re passionate about our customers and our work here and we have fun doing it together as a team. 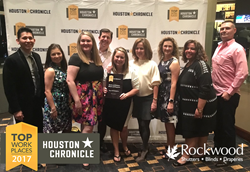 Rockwood Shutters has been awarded a 2017 Top Workplaces honor by The Houston Chronicle. The Houston based shutters manufacturer was named a finalist in the midsize company division and also received a special award for Work/Life Flexibility. The Top Workplaces lists are based solely on the results of an employee feedback survey administered by WorkplaceDynamics, LLC, a leading research firm that specializes in organizational health and workplace improvement. Several aspects of workplace culture were measured, including Alignment, Execution, and Connection, just to name a few. Headquartered in Houston, Texas, Rockwood Shutters specializes in manufacturing interior window shutters and selling complete window treatment solutions for any window. The very best of traditional craftsmanship is seamlessly integrated with the latest technology and engineering innovation in the state-of-the-art Texas manufacturing facility. Every order received is custom manufactured to the exact window dimensions and characteristics in accordance with the design specifications. Rockwood window treatment solutions, which include shutters, blinds, and draperies, include complimentary in-home design consultation with professional installation. Rockwood is relentless about providing quality products with features that are unique in the industry.